Should I buy this wig? I wanted to post more pictures of the band fall that I am selling. It is a 16/10 color - dirty blonde mix of colors and is approximately 16 inches long. I bought this in 2007 and wore it on weekends for about a year. The hair feels very silky, it is not dry. The main reason I wore it so little was because the cap was too small for my head and it was uncomfortable. I am a size XL and this wig is marked a medium. It has elastic straps so it can be made even smaller. Additionally, the hair directly under the neck did knot occasionally after being worn for an entire day. I just want to be completely up front about this piece since I am selling it as is with no returns. It has been kept in good condition in a non-smoking home, and has spent most of the past 4.5 years on a wig head in a closet. It has a stretch cap made up of closed wefts. Pictures were taken indoors with flash - hence the light streak. There is one photo taken in 2007 that was taken in natural light in the album. 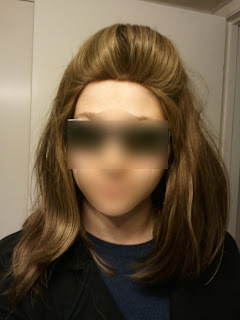 I am currently cleaning out my closet and I wanted to sell some old wigs that I never wear. I am selling them at extremely low prices, which I think are fair prices considering their quality and the fact that they are used. Even if you do not plan on wearing them, they can be used to practice styling, cutting or dying or they could be turned into hair extensions or be worn as hat falls etc. Some are in better shape than others. Additionally, I have some brand new tichels that I received from friends when I got married that I have never worn because they were the wrong color for my skin tone. The scarves and tichels are on sale for $5 each. There is also one hat for sale that I wore once or twice. Shipping: I will ship items within the USA for $6. You may buy multiple items and I will group them together in one box for the same price. Ask me about international shipping rates if you are in a country other than the USA. Purchased in November 2010 from "thebestoutlet" eBay user. Item came in a priority mail box promptly, but was only wrapped in tissue paper, so it probably got shaken around a lot in transfer. Seller communicated very clearly and shipped item promptly after payment was received. L'Oreal Sally's Beauty semi-permanent dye with 10 volume creme developer. Lightest ash brown. (4A or 5A) Applied with foil highlighting technique. Washed and conditioned with color-safe shampoo and conditioner, partially air dried, partially blow dried. After completely dried I curled every strand with a curling iron. Conclusion: Good purchase, very good piece for the price and quality. Cap is very small for someone with a large head though, have to wear at least 1 inch back. Can be worn with headband too. Wig needs styling to look presentable, air dries with frizz. Not the lightest cap technology, but not extremely heavy either (old styles use older technology which is not as stretchy and light as wigs that are manufactured today). I did not get this cut, so that also saved a lot of money. I recently bought 2 gorgeous Freedas from an Ebayer who sells discontinued wigs. I noticed on your blog that Freeda has changed their standard cap to stretch. So these are mono top wefted caps - if that might give an indication of how long ago they were made. I assume that the wigs are processed because the color is a *perfect* 2-Darkest brown. I hope to High Heaven that the cuticle has not been stripped, not what I would expect from a Freeda. I washed and air dried the wigs (they dried slightly wavy - nice!). The hair is still silky soft and holds a decent curl from the curling iron. Would no doubt be better from a set. I am SO happy with these sheitels I can't tell you. Just like it never bothered me to have "last year's" anything - so too with the sheitels. The Ebay seller had excellent communication and unlike a sheitel macher, I could return the wigs if didn't want them after all. Please feel free to write about my experience on your blog. Attached is a photo of the sheitel the day I got it. 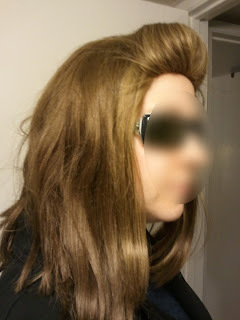 I posted about a synthetic wig that I had bought on Ebay here and one of my readers bought it. See below how she styled it to make it look more natural, since it did have a shiny "barbie-like" hue to it, and was incredibly long. How do I wash my curly sheitel at home? I have tons of knots. How do I get them out without ripping all the hair out of the sheitel? Also, what are the recommendations for daily maintenance of my curly sheitel? For example, how often should I brush it, gel it, and wash it? Thanks!!!! and spray on detangler or conditoner. Use sectioning clips to separate the hair into sections: Start with the lowest thin layer down. Spray on water and/or detangling conditioner onto layer, and very gently from the ends (bottom) up, slowly and carefully comb downward until the knots are detangled. once the section is detangled, let the next thin layer down and repeat the process. 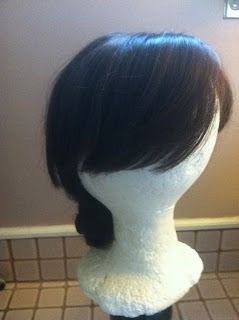 Once the entire wig is detangled, the wig can be attached to the foam head and the normal washing process can commence. CAUTION: you must be extra careful while washing to spread the shampoo and conditioner downward on the wig and never upward against the curly cuticle. That will just create large knots and tangles. You can use watered down shampoo or as little shampoo as possible. I try to just use a little close to the "roots" to clean the parts that get sweaty, and not necessarily apply the shampoo to the ends which tend to get dry, they get cleaned by nature of the water running down the hair to the ends of the roots. Run the soapy mixture downward using a lot of water. Rinse. Apply conditioner in the same manner but do not apply the conditioner to the multi-directional part of the sheitel because it can cause the knots (individual hairs that are handtied) to come loose and come out of the cap. While conditioner is applied, run fingers through hair to make sure the knots are still non existent. If knots are present GENTLY try to detangle with fingers or wide tooth comb while conditioner is applied. However, knots should not be present, and its a little risky to do this while wet we can do this in the next step as well. Rinse out conditioner unless conditioner is a "leave in conditioner" which is sometimes best for curly hair. Take wig off of head and gently place into a bath towel and enclose. Let it dry for 5-15 minutes in the towel. 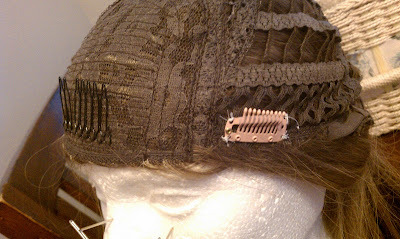 Then gently open towel and place on wig head, remembering to only pin near the ear clips as shown in the straight washing video. There are three methods of drying at this point. GVP Silk Treatment gives hair a smooth and silky feel while providing a brilliant high gloss shine. Repairs split ends and gives hair incredible shine with no build up. 3. Blowdry with a diffuser attachment on a blowdryer (products safe for heat can be used in this instance) . While using the diffuser attachment as shown below. 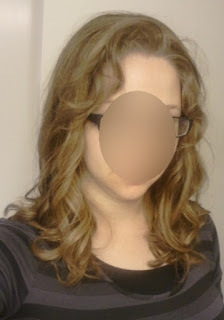 Scrunch sections of hair with hand upwards while blow drying with diffuser. If you applied leave in conditioner you may not need an anti-frizz product like biosilk. Use very little because it can make the hair look oily. Remember shampoo is the enemy of curly hair because it encourages frizz. Conditioner is our friend but must be used in moderation and well rinsed to not appear oily. For maintenance you can use the spray bottle and comb to remove knots, you can spruce it up with a little product and scrunch and let air dry. If you are trying to "maintain" a curling ironed wig without washing, it will be tough to fix individual curls, but it is nonetheless doable. Please post questions below as comments. Best of luck. I'm in the market for a new sheitel on a budget, I went to a well known sheitel mocker who sells her returns at almost half off. I looked at a long piece that was returned due to frizz, the mocker was unsure how bad the frizz would get so i did your shower test. I ran the water for 20min with the sheitel in the room the left the sheitel in the room until all the steam was gone. The bathroom was so steemy that the cabinets on the other side got wet. I am planning on moving to a humid area but the sheitel mocker said to use bio silk and use a straightener on it weekly to contain the frizz. 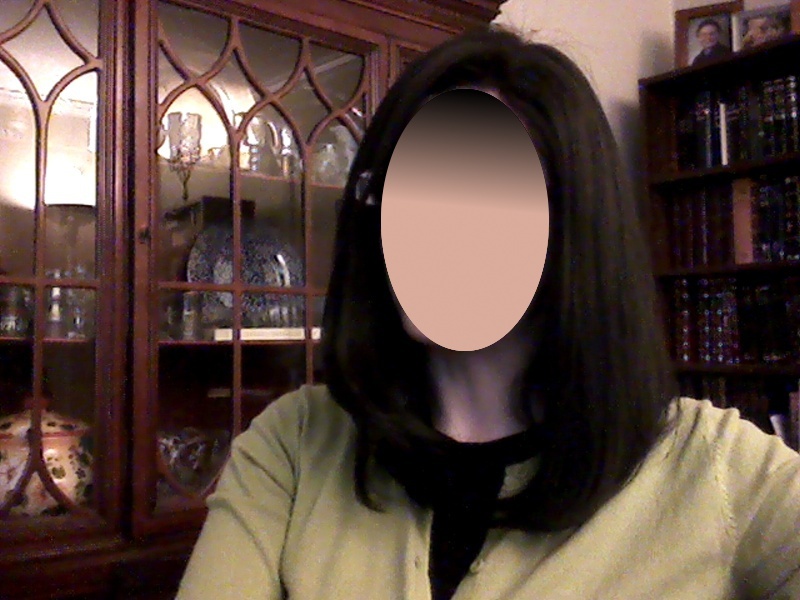 My husband felt the extra use from the straightener would lower the life of the sheitel. I need to get the cap replaced due to size but the current cap has a hole that was repaired and another hole, making me wonder how long someone else owned it for and the abuse they might have put on the hair. The frizz wasn't so bad. Do you think I should get the sheitel? 2. Why there is a hole in the cap? 3. How much it will cost to replace the entire cap. How good of a deal is this, because size is one of the first things that should be right when trying on a sheitel. If it is not comfortable and ill-fitting, it is bad before even considering the quality of hair and the color. That being said, I am so glad that the sheitel macher let you take it home to try the frizz test. I think the most important is a good fit, a good color match and your potential happiness. If you do not absolutely love it in the store then you won't love it once you purchase it. If you love it but are concerned about a little frizz that it definitely can be remedied easily with biosilk and the right heat products in moderation, and considering the discount price it may be the best thing to do in your budget. In humid climates ALL hair is going to frizz a little bit, unless its that stick straight fine hair, which is rarely found on sheitels these days. Make sure that the "good deal" is still a good deal considering the amount of money you will be putting into it in order to repair the holes and replace the cap and probably the new sheitel cut. If a sheitel has holes, it must be at least 6 months old because holes do not usually form that fast, unless the wig was truly defective. Some of you may remember my review of my Freeda Riva which I purchased in 2008. In the past year or so I had really gotten tired of the cut and texture and starting wearing my falls instead. I didn't like how thickly the hair framed my face and I believe I look so much better with the hair out of my face like when I wear my fall. 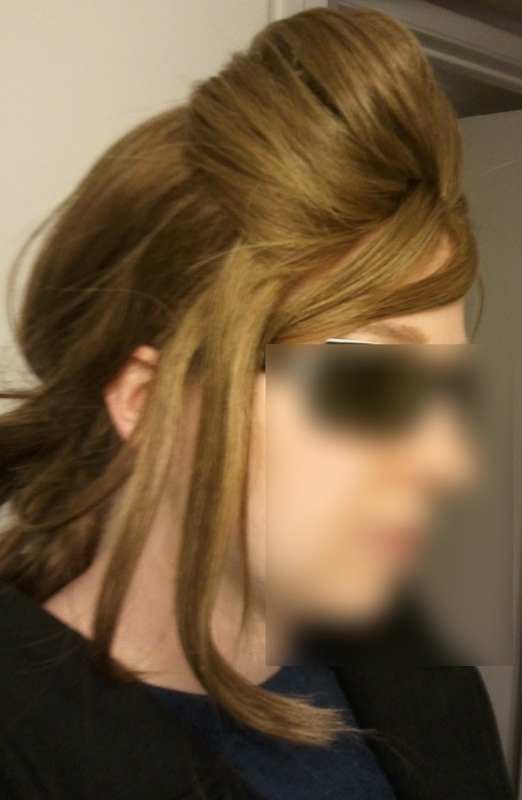 A few months ago I decided to pull it back in a ponytail to make it wearable and I realized that it actually looked kinda good. The problem however was that the wig was set in a deep side part meant for side part side bangs look. So I decided to do a full wash and set (it was dirty anyway) and to change the multi-directional scalp part of the wig to be angled backwards so the hair fit nicely into a pony tail holder. For instructions on washing please check out my other videos found here. To change the part I very delicately combed (with a very wide toothed comb) small sections of the part backwards until the hairs were no longer parted to the sides. This video starts once the hair was parted and divided into sections. Not shown on the video is how small the sections I split the top layer into (about an inch wide) once I got to the multi directional part, to make sure the hair was blown flat. Watch the video and enjoy!!! The finished product turned out to be great! I also changed it to be half up on Shabbat and it looked great because the top layer that was pulled back into the pony looked natural! Dear Readers, I recently reviewed a few pieces that I received from MyHeadcoverings. For the next week and a half AskChavi readers can receive a 10% discount on orders placed with www.myheadcoverings.com by using code 'askchavi'. Additionally, one lucky reader will be entered in the chance to win $20 credit from MyHeadcoverings! All you have to do is check out www.myheadcoverings.com and find your favorite item and then comment about the item on this post!! Double your chance of winning by liking MyHeadoverings on Facebook! http://www.facebook.com/pages/MyHeadcoveringscom/135559593151974 Comments must be posted by June 15, 2011 to be eligible for the drawing! I received my items quickly and in a secure padded envelope. The items were nicely wrapped and very clean and presentable. They have fast and affordable shipping to the United States and Canada. They also offer international shipping. 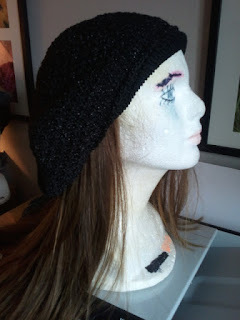 The Lurex Beret was incredibly comfortable and stretchy. I have a large head and have to wear a large or extra large sheitel so I was pleased that the beret fit over my head and could also be worn over a fall. I actually was able to wear it with my hair tucked in and it was really cute. I like the sparkly inside and the light weight. The Israeli Pre-tied tichel was great because it combined my two favorite things: Israeli Tichels and Pre-tieds! 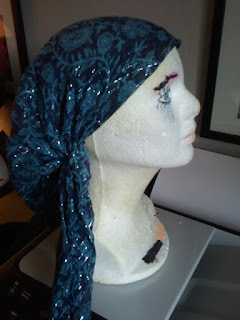 This is a great option for people who do not want to bother with tying an Israeli Style tichel but want the look of one. It was very comfortable and the elastic held it onto my head securely. The pre-tied headband is made of very stretchy material that is very comfortable and does not hurt my head, even though I have a large head. I like that it is wide but can also be folded to be narrower. I love my new black Azhur knit crochet snood and I think it is very beautiful. I love that it is sparkly and I love that it is black so it matches everything. I wear it as a snood but showing two fingers width in the front. 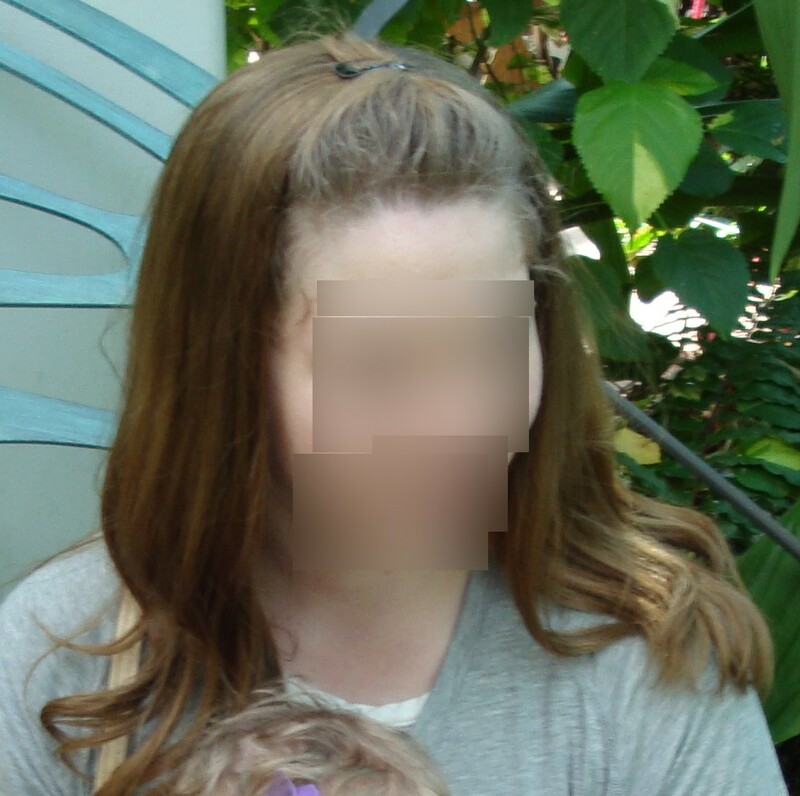 It also looks great covering all of the hair, as shown in the video above. It is lined so absolutely no hair will show through. I read your post about the "Band Fall Bump Phenomenom". I am wondering, what falls are you able to do that with so that you dont have the net/cap in front? I am looking to purchase my first fall. I cant afford a hat fall and band fall, so I am trying to find one that I can use for both. When I use the band fall, I am not sure if I will have the band all the way in the front or I will have bangs added on. So I am looking for one that I can do that also. 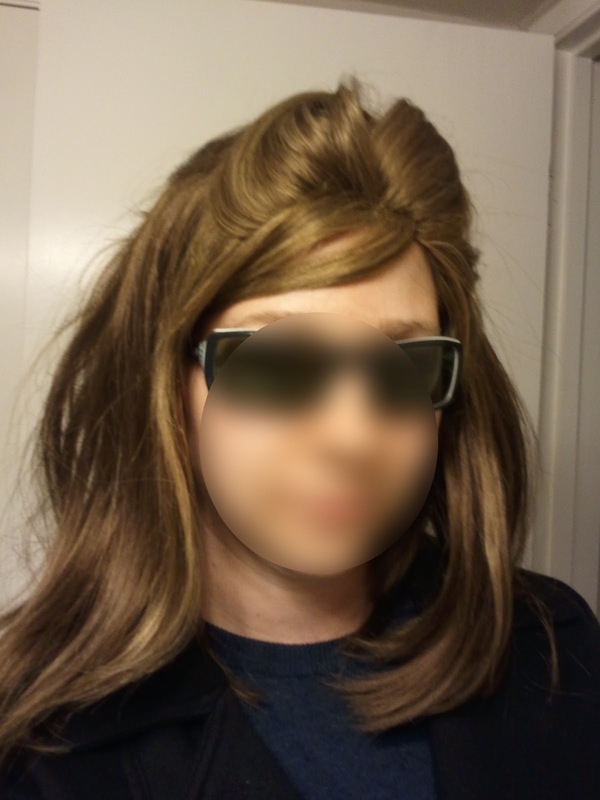 However, while (at first) most of the time I will not be showing any hair at all, but as time goes by (and depending on the situation), I want to be able to have my hair like you describe in your post as I think it looks much more natural. I am also looking the it should be longer (some where between 18 - 20 inches). I have ash brown hair. 4) With a "Band Fall Bump"
Readers, it took me a long time to think about this and then I realized I had a piece that I had not touched in years that was actually suitable to demo as a bump-fall without showing hair. It obviously does not look as natural as integrating hair in the front, but I think it can actually be worn to look natural and trendy. So I happened to have a Chinese haired processed Yaffa fall called "superfall" that I bought for about $200 before I knew ANYTHING about sheitels back in 2007. It was a thick "horse-hair" type sheitel that had wayyyy too much height on top, which made it virtually impossible to wear with a headband, also it was extremely heavy and uncomfortable so I basically thought I had wasted my money. 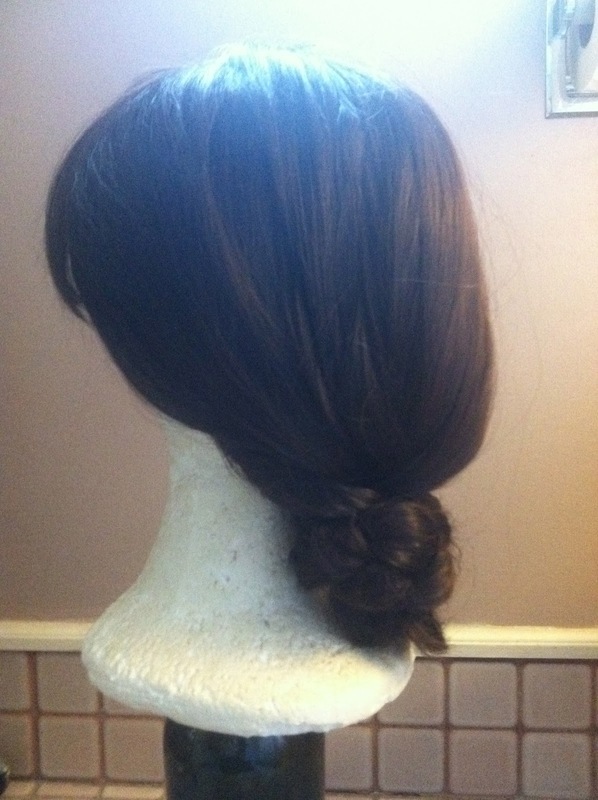 HOWEVER, after playing around with it today, such a piece could be the answer to ladies who do not show any of their own hair and want to wear the trendy "bump" style. I had some hesitations at first. For example, falls are cut STRAIGHT across the forehead and therefore do not look natural since real hairlines have peaks and valleys, some women having larger widows peaks than others, but regardless no one's hair line is cut straight across like a wig. Here are the pictures from the initial styling, looking quite WIGGY. Then I thought of another idea, that if a little hair was taken from the bump in the front and instead integrated as a sweeping side bang, it could camouflage the straight hairline, thus making the wig look more "natural"
Lastly, I played around by inserting a foam roller under the bump to make it dramatic and more "Lady Gaga" like with ponytail bun. To answer your question, yes, you would need a fall that did not have the tape in front in order to bump without showing hair. However, its a complex situation in that you want the fall the serve as a hat fall, headband fall AND bump fall. This type of fall with a lot of volume on top would be terrible as a hat fall. 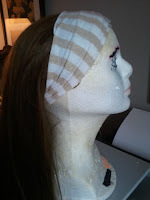 The falls with the rim in the front actually lay much flatter when putting a headband over them and be superior for use with a headband and would also work nicely with added wig bangs in front of the headband. I am currently doing research into producing a realistic looking fall/sheitel that will cover all the hair and properly bump and be versatile. Additionally, even though my Freeda fall does not have cap in front, the hair sewn in front is a very thin layer and does not allow for enough height because the hair behind it is wefted and thus going downward and not "upward" as we would need in order to bump. 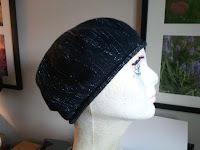 A hand sewn multi-directional fall cap would be ideal to move in all directions necessary. Also, I think its a much better idea to get a headband fall instead of a hat fall because a hat fall does not have that many uses, whereas the right fall with a hat or scarf over it can look fine as a "hat fall"
I get a lot of emails during summer from women complaining about their "pouffy", "frizzy" wigs. As it turns out, wigs that seem nice and beautiful in the salon can become huge and frizzy as soon as humid summer rolls around. I heard a story of a particular sheitel shop where the woman runs a dehumidifier in the studio to keep the wigs smooth looking. That is so deceptive! As soon as that girl steps outside the wig could become frizzy. Products can help, but sometimes its the particular hair type that is more prone to frizz than others. Wavy hair that was blowdried straight will gradually get wavier as the humidity goes on. I thought of this recently. I took me and my Milano Bandfall to Florida in February (yes, it was fabulous). Anyway, I wore my bandfall bump style, as it turns out my real hair was really frizzing up, but my processed Milano pretty much stayed the same. Maybe it was the perfect combination of hair sprayed curling-iron-curls mixed with dirt and grime. Either way, it worked out fabulously. Then this morning the frizz test occurred to me. I was running my shower on just hot for 10 minutes as I wasn't able to get into it as soon as I would have liked, and when I came back the windows and mirror were completely fogged and there was a thick layer of steam in there. People should ask their sheitel machers if they can take it home for a night, uncut before they commit to buying it so they can test whether it will frizz in humidity. You can create that humid environment in your very own bathroom! Please note how much my real hair frizzed (without any product in it) contrasted with the Milano made of processed "European Hair'" and with some hairspray stayed flat. Most wig wearers have probably experienced the following scenario: After a year of wearing your favorite wigs one of the snap clips breaks or sometimes comes loose. Usually a wig wearer will bring the wig to their sheitel macher who probably charged $10-$20 to replace the clip, when in actuality the clips are available for less than $1.00 and all it takes is a little sewing skill. 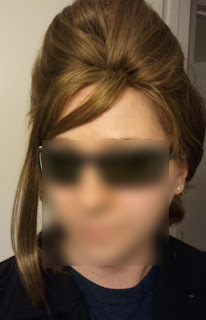 My recent situation was that I bought a wig over the internet that did not come with side snap clips, only a center comb which I found basically useless for keeping it secure on my head. 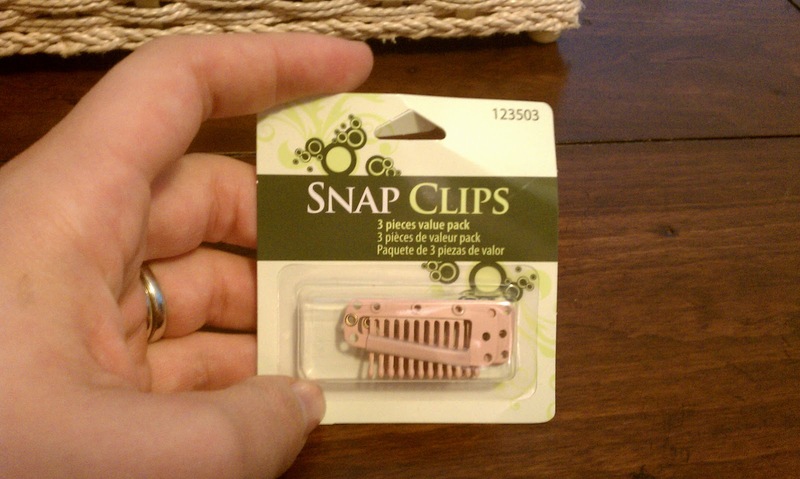 I found a set of tree snap clips from Sally's Beauty for $1.99. Hair Extension Clips They had this light color pictured right, and black. I bought the light one since the wig is blond. First you must thread the needle. I like to use about 4 feet of thread at a time because I was always taught to double up my thread and I had threading needles so I'd rather deal with a thread tangling then having to re-thread 3 times during the process. 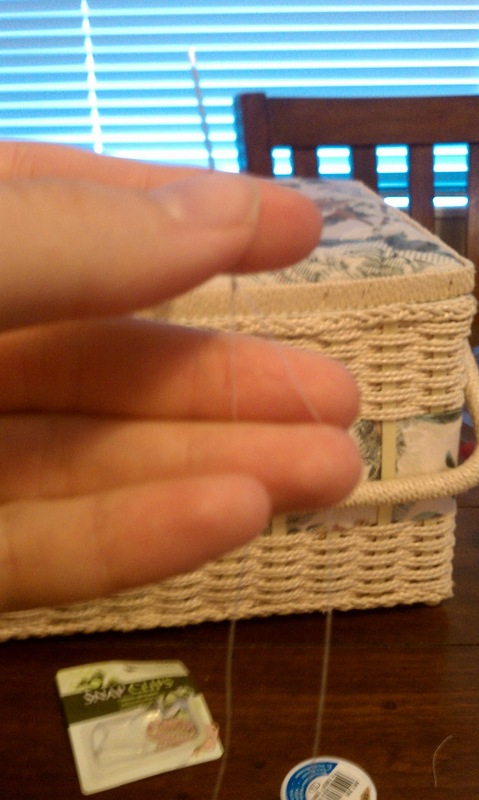 I loop the thread through the eye of the needle, then make the 2 ends meet, I tie a knot by wrapping both ends around my finger a few times and then rolling tightly towards the end of the finger, it usually produces a little string that you can then pull on and the threads knot. Or you can just knot the ends manually, but do not do a slip knot. It is very important to have the combs facing into the wig. Once I spent 10 minutes sewing in a clip and I sewed them in facing out, which was incorrect, I then had to start over. Secondly, I like to have my clips closer to the ears and father from the top of the temples, because when I used to have them by the temples (especially on falls) I would get terrible headaches. Keep in mind that I do not even clip my clips, I just clip them to my head while open. For sewing the clips, I use the four holes on the clip and basically anchor each one to the wig. Figure out which part of the wig will hold the first hole and loop the needle and thread through the wig cap, I usually make a little knot by looping my needle through the two attached threads and pulling to the end which the end knot will be against wig cap. I then loop around the edge of the clip hole, into the cap, back up through the hole, about 3 or 4 times until it seems secure. I then tie a knot on the tread to secure it. I repeat the process for the three other corners of the clip. I find it helpful to place the wig on a wig head inside out. If you see the picture above you can see my white thread and how there are tiny knots securing each corner. It is also a good idea to move your clips around every few months if you are having thinning hair or balding as a result of wearing your wig frequently. 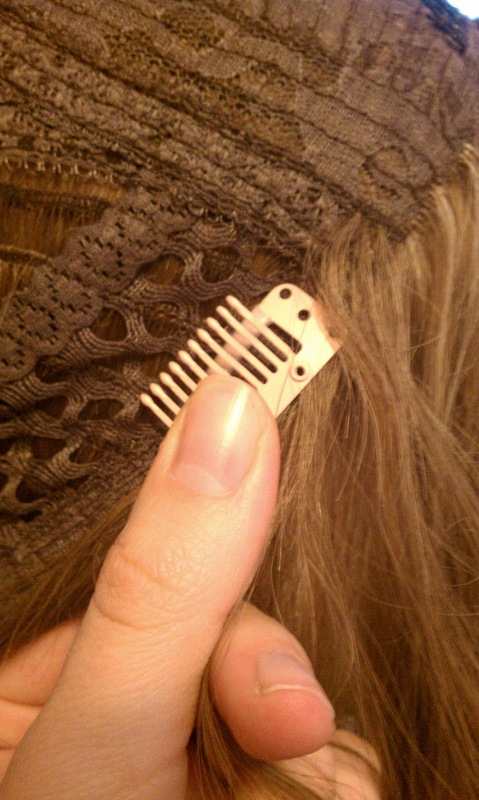 Moving the clips should give the section of hair that has thinned time to regrow. If you have a handtied cap please be very careful about not ripping your cap, it is best to sew the clips in the ear area, which is usually reinforced, they very edge of the wig should be stronger and serve as a good mounting point. Additionally clips could be sewn into the bottom of the wig to allow the wearer to wear a more natural ponytail. One of the most shocking things about becoming a mom is realizing how many diapers a baby goes through each day. Diapers really end up adding up! After scurrying from drug stores and Target and Walmart trying to find the best deals on diapers and clipping coupons I discovered how amazing and convenient it was to order diapers online from Amazon, not to mention cheaper. For example, I buy Pampers Baby Dry diapers in size 3 right now. Amazon sells them for $40. But thanks to two Amazon programs, Amazon Mom and Subscribe and Save the diapers come out to a total of $28 with free shipping to my doorstep! Amazon reduces the price of diapers by 15% for members of Amazon Mom AND you get free 2-day shipping! If you order them with Subscribe & Save you get another 15% off and free shipping on items you routinely use and keeps them coming every one, two, three, or six months. You can change your delivery schedule or cancel at any time. For example, I recently ordered the diapers shown above, and I specified subscribe and save. I wasn't sure when I would need new ones, or if my baby would grow out of size 3 so I specified delivery every 3 months. It turned out that a month later I needed a new shipment of the same size so I simply went to my Subscription page within Amazon.com and clicked on "send me more now" and in a few days the diapers arrived at my doorstep. I also made sure that the next scheduled delivery would be postponed. Thanks to these incredible programs I get the name-brand Pampers diapers that I love, shipped to my door, tax free for a great price! I highly recommend the program and am considering trying out Amazon's Subscribe and Save program on household products such as toilet paper and paper towels. I still need to do a little research to see whether Costco, Target or Amazon is cheapest. Here is a video I made of my most recent dye project. The wig was a human hair Milano Collection Wigs fall. It was originally 12/14 but it oxidized. I used Clairol professional hair color in shade 5AA lightest very ash brown with equal parts level 20 creme developer in hopes to dye it to a light ash brown shade. The project was not entirely successful, as the dye was not equally distributed throughout the hair. I should have used twice as much dye and developer and spread the mixture throughout the hair while wearing gloves. I believe the 20 minutes process time was correct. I found a great blog post in which the author (a professional colorist) explains how hair color works here.